Untitled Moments is an urban plan that emerges before your eyes. 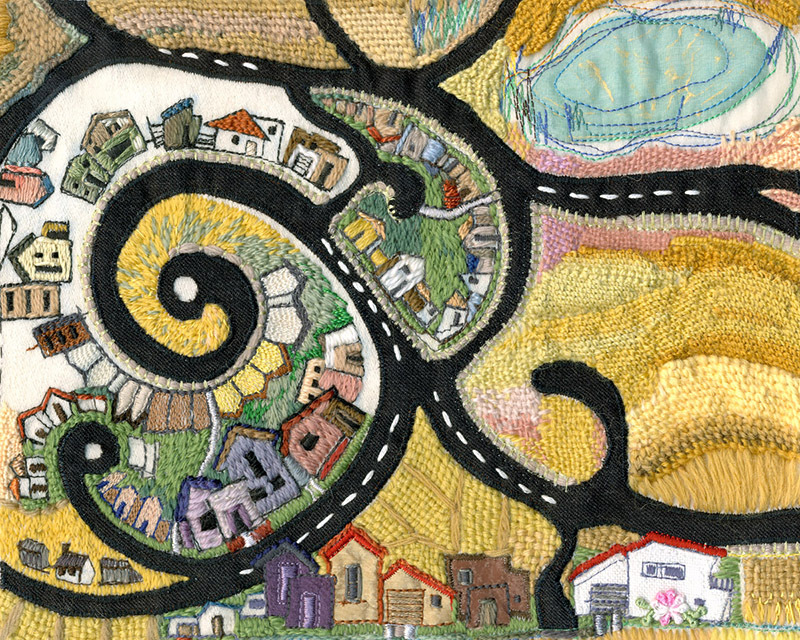 Wildlife is forced to share its habitat with the growing suburban footprint progressively becoming more prominent in the frame, as the hard street plan softens through an embroidered animation that re-evaluates the landscape in a charmingly hypnotic fashion. The trio wished to create something from Canberra's most unremarkable moments. The result is anything but dull. The title is the most important part of a work. if you don’t pay attention, you miss the best bits. Untitled Moments is a collaborative project exploring the visual impact of embroidery, drawing and photography in a digital animation. We’ve used digital technologies to combine embroidered images with drawing and sound to create narrative sequences, imagined incidents drawn from our observations of Canberra’s most unremarkable moments. Embroidery was often used for story telling and moral instruction. It employs a variety of stitches to create symbols, figures and text. Sometimes these elements are understood directly; in other cases they serve as references in a spoken narrative. Embroidery has been applied to objects in domestic, religious and ceremonial settings, but these are almost always static objects. The narrative drive is provided by other media or by the viewer’s memory. Traditionally, animation worked in a strictly two-dimensional plane, using lines, shapes and colours to create the illusion of movement. Now animation uses increasingly sophisticated three-dimensional effects and photorealistic surface textures. In this work we’ve applied embroidery’s textural effects to enhance the viewer’s engagement with a narrative. While it’s being made, an embroidered image isn’t accepted as a work in its own right. It’s only accepted as an object worthy of viewing once every stitch has been completed. But there’s an inherent pleasure in the experience of stitching a work. Here there’s space for an embroiderer to dream, to imagine the next step, to explore the potential for variation. With new digital technology, each step can be captured and the process revived or reinterpreted. The journeying may be more rewarding than the arriving. And, unlike documentary film, digital technology allows for nonliteral descriptions of the process. In this case, the resulting work builds on our observations of unremarked events in an everyday urban environment—Canberra’s untitled moments. It’s probably the first digital animation in the world to be based on embroidery! In considering the sound for Untitled Moments , the central idea, clearly evident in the visual material, needed an equivalent parallel in sound. In this respect, the sound was expected to also convey those moments that fill our daily lives but which we generally take for granted. As it happened an approach to this creative undertaking was found in sounds recorded in the very early summer morning just outside Canberra. In fact, the wildlife provided such intensely rich and dramatic sonic material that it was a near perfect source for transformation into more abstract forms needed for the unfolding visual material. The natural sounds have a compelling significance when critically listened to and as the visual material becomes more local and personal, appropriate processing of these sounds complements the urban dynamic we also readily accept. The temporal pace of the visual material simultaneously provides a clue as to the structural form of the sound but a deliberate or precise temporal correlation was studiously avoided. The overall result achieved is a complex interrelation between the visual and sonic material. Further, it is likely that repeated viewings will provide different overall impressions, a strategic design feature the authors considered important in supporting the concept of Untitled Moments . This page was last updated on 18 January 2019 .